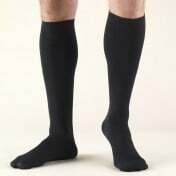 Truform Knee High 30-40mmHg Support Socks combine affordability with all the medical benefits that the health industry demands from a Compression Therapy stocking. These Truform Classic Medical Support Socks flaunt a classic unisex style that can be worn for any occasion. While supplying compression, their opaque fabric will discreetly conceal skin blemishes and other visible symptoms of low leg circulation. The spandex and nylon blended fabric creates a firm, yet elastic feel to maintain accurate pressure levels in the range of 30-40mmHg. Their fabric also gives the stockings extra durability you can count on. Doctors recommend Compression Stockings to treat a variety of circulation disorders, including deep vein thrombosis, edema, varicose veins, chronic venous insufficiency and thrombophlebitis. If you're looking for relief from leg pain, moderate to severe swelling, spider veins, tired, heavy legs and feet, or if you spend long periods of time sitting or standing, these medical socks can help. Their open toe feature will also help disperse heat from the toe area and keep the toes pressure-free. This is especially nice for patients with sensitive toes and feet.